Objective The objective of the present review is to evaluate multicomponent/complex primary care (PC) interventions for their effectiveness in continuous smoking abstinence by adult smokers. Design A systematic review of randomised and non-randomised controlled trials was undertaken. Eligibility criteria for included studies Selected studies met the following criteria: evaluated effects of a multicomponent/complex intervention (with 2 or more intervention components) in achieving at least 6-month abstinence in adult smokers who visited a PC, biochemical confirmation of abstinence, intention-to-treat analysis and results published in English/Spanish. Methods We followed PRISMA statement to report the review. We searched the following data sources: MEDLINE, Web of Science, Scopus (from inception to February 2014), 3 key journals and a tobacco research bulletin. The Scottish Intercollegiate Guidelines Network checklists were used to evaluate methodological quality. Data selection, evaluation and extraction were done independently, using a paired review approach. Owing to the heterogeneity of interventions in the studies included, a meta-analysis was not conducted. Results Of 1147 references identified, 9 studies were selected (10 204 participants, up to 48 months of follow-up, acceptable methodological quality). Methodologies used were mainly individual or group sessions, telephone conversations, brochures or quit-smoking kits, medications and economic incentives for doctors and no-cost medications for smokers. Complex interventions achieved long-term continuous abstinence ranging from 7% to 40%. Behavioural interventions were effective and had a dose–response effect. Both nicotine replacement and bupropion therapy were safe and effective, with no observed differences. Conclusions Multicomponent/complex interventions in PC are effective and safe, appearing to achieve greater long-term continuous smoking cessation than usual care and counselling alone. Selected studies were heterogeneous and some had significant losses to follow-up. Our results show that smoking interventions should include more than one component and a strong follow-up of the patient to maximise results. Our systematic review shows that multicomponent primary care interventions yield feasible, effective, safe smoking cessation. Multiple component primary care interventions best achieve long-term continuous abstinence. Multiple component strategies should include setting a ‘D-day’ and drug therapies. Despite the rather strict inclusion criteria of the present review, we found quite high heterogeneity in the results. Most essential components of the interventions studied are not clearly established. The purpose of the present paper is to undertake a systematic review focused on multicomponent interventions, with the aim to offer a tool that could be useful both to researchers and general practitioners in the primary care setting. The specific objective of this study is to determine the effectiveness of these interventions in achieving continuous tobacco abstinence in smokers aged 18 or older in the primary care setting. In order to make the findings more practical and applicable, our search strategy was focused on primary care setting. Primary care is the most adequate and important setting to implement interventions, to help smokers quit, because most smokers visit their primary care professionals at least once a year5 ,24 ,25 and is the healthcare level that can systematically integrate the methodologies for health promotion and disease promotion. Articles included in this review met the Population, Intervention, Comparison, Outcome (PICO) criteria contained in WHO guidelines. Selected studies met the following criteria: evaluated the effects of interventions with at least two interacting components in individuals older than 18 years who smoke any quantity of tobacco and receive primary care. Smoking cessation was considered by achieving at least 6 months of continuous smoking abstinence, verified biochemically. The definition of continuous smoking abstinence was based on that proposed by Hughes et al27 in 2003: a period of total abstinence between a quit date and a follow-up evaluation. We selected randomised controlled trials (RCT) or non-RCTs, published in English or Spanish, which included interventions with at least two components, designed to help patients stop smoking and took an intention-to-treat (ITT) approach. Studies were excluded that were carried out only in adolescents (<18 years old), did not report continuous abstinence (≥6 months), were not carried out in the primary care setting or did not analyse the data by ITT. Data from individuals with certain diseases (eg, cardiovascular disease or diabetes) and specific sectors of the population (eg, pregnant women) were included if the study had been carried out in the primary care setting. Searches were conducted in three databases, MEDLINE (via PubMed), Web of Science and SCOPUS, and supplemented with a manual search of the archives of three key journals: Addiction, Tobacco Control, and Nicotine and Tobacco Research. In addition, the periodic alerts from Smoking and Tobacco Abstracts and News (STAN Bulletin)28 were searched, followed by a reverse search based on references cited in the key articles recovered using the initial search strategy. The search period extended from the inception of the database or journal through the end of February 2014. The entire search process was supported by bibliographic specialists of the School of Medicine, Universitat Autònoma de Barcelona. The search strategy combined a controlled vocabulary and free-text terms; the full strategy used for MEDLINE (via PubMed) is described in online supplementary annex 1. All references identified in the different databases were imported into Reference Manager (V.12), and duplicate bibliographic records were eliminated. Ten reviewers participated in the selection process. Each article identified was randomly assigned to two reviewers, who independently reviewed the title and abstract to identify articles meeting the inclusion criteria for full-text review. Each reviewer received the basic citation data, the abstract and an Excel database containing the fields to be considered (study population, primary care setting, type of intervention and results obtained). Any disputed selections were resolved by a third reviewer. Two different reviewers evaluated the full text of the selected articles to confirm their eligibility according to the inclusion criteria. In case of any disagreement, a third reviewer made the final decision. An ad hoc form was designed to extract data from the full text of the selected articles. To assess the methodological quality of the selected studies, the SIGN (Scottish Intercollegiate Guidelines Network) checklist for RCTs was used, along with a version of the SIGN guidelines adapted for non-randomised studies (see online supplementary annex 2). The quality review included 10 general items and overall evaluation item that classified each study as high quality, acceptable or low quality. A study was considered high quality if it met the majority of the criteria, showed little or no risk of bias, and the results seemed unlikely to change due to additional research. Quality was considered acceptable if most criteria were met but there were some flaws and an associated risk of bias, and further study could change the reported conclusions. Studies that failed to meet the majority of the criteria, had major flaws, and whose conclusions were likely to change in light of further studies were considered low quality and excluded from analysis. The present review is narrative because of the great heterogeneity of the studies included. Differences in the age of participants, populations studied, diversity in statistics and outcome measures made unfeasible to report a global effect size. Moreover, the type and duration of the interventions and follow-up varied widely among the studies, and consequently a formal meta-analysis to combine study results was not possible. The results of the selected studies were summarised in tables that show the years of the study, the population, type of study, type of intervention, major results, author conclusions and methodological quality of the study. A total of 1651 records were collected, of which 504 (30.5%) were identified as duplicates. Once the independent paired review of the 1147 records was completed, 1026 (89.5%) were excluded from further analysis. Of the 121 publications selected, 4 were rejected after a second paired review of the corresponding abstract. Full-text review was completed for 117 (96.7%) articles. After paired review, 10 publications (9 studies) were finally included in the present narrative review. The reasons for discarding articles at the first and second levels of paired review are shown in figure 1. Flow chart of article selection for the study. The primary characteristics of the nine studies included in the present review, as well as the major results and conclusions are detailed in table 1 (panels A and B). Eight studies are RCTs and one is a non-RCT.29 Two publications refer to different aspects of the same RCT.30 ,31 Inclusion periods ranged from the mid-1990s to the first decade of the 21st century. Five of the studies were carried out in the Spanish population and the remainder in the German population,32 the USA,33 China34 and Holland.35 Of the nine studies included, eight were carried out in the general population and one in patients with chronic obstructive pulmonary disease.34 The number of smokers participating ranged from 89 in Spain36 to 3562 in China.34 The selected studies included a total of 10 204 participants and the follow-up varied from 6 to 48 months. Some studies included smokers of any quantity of cigarettes, while Twardella and Brenner included only those who smoked more than 10 cigarettes daily and Daughton et al33 required 20 cigarettes daily for inclusion. Six studies had a control group receiving usual care, and all nine compared at least two groups. The measurement of exhaled carbon monoxide (CO) was the main biochemical means of confirming abstinence; only two studies35 measured cotinine, in urine and saliva, respectively. In some trials, the intervention occurred with smokers at the preparation phase,29 ,34 ,35 ,37 which generally, but not always, increased the number who quit smoking and decreased the number who abandoned. The trial by Cabezas et al30 and Puente et al31 included smokers at all stages of the change process. In the study by Torrecilla et al,38 despite focusing on a population at all stages of change, patients in the preparation phase were accepted as referrals from other practices. All of the studies obtained an ‘acceptable’ quality score (table 2). The major quality problems were the lack of blind interventions and the heterogeneity of losses to follow-up, ranging from 1.2% to 76%; in fact, three of the studies30 ,31 ,35 ,37 reported more than 40% loss to follow-up and a lack of blinding in the interventions. All of the studies applied ITT analysis (loses to follow-up were considered as smokers). All of the selected studies, as expected because it was a criterion for inclusion, confirmed tobacco abstinence by some biochemical test. The studies based the multicomponent interventions for smoking cessation on the following components: raising awareness of the problem, education, motivation, behavioural change and medications. The methodologies used in the interventions were mainly individual or group sessions, telephone conversations, brochures or quit-smoking kits, and medications. Other approaches included economic incentives for doctors and no-cost medications for smokers,32 ‘homework’ assignments, and multifactor, community-based care. In most studies, the control groups received usual primary care attention, including brief advice to stop smoking or an informational brochure about the harmful effects of tobacco on health. Only Daughton et al33 provided a placebo patch, worn for 10 weeks, and two primary care visits dealing with smoking cessation: their objective was to assess the effectiveness of the nicotine patch and they sought to ensure that the control group had the same characteristics. The study by Secades-Villa et al36 took a different approach, delivering some type of intervention in all three study arms. Behavioural interventions were mainly mixed models based on clinical practice guidelines: behavioural therapy, the motivational interview proposed by Miller and Rollnich,39 and the transtheoretical model of change.40 Most of the Spanish trials reviewed30 ,31 ,37 ,38 stand out for the following common characteristics: use of the model developed by Prochaska and Diclemente, advance training for participating health professionals, selection of a D-day to stop smoking and the use of medication at the discretion of the prescribing physician. In the study by Cabezas et al and Puente et al, a patient recruitment model adjusted to ‘real-life’ conditions and usual clinical practice was used, attracting patients from the general population who visited their health professionals spontaneously. As can be seen in table 1 (specifically panel B) the majority of the included studies (seven out of nine) set a D-day for the patients to stop smoking. Scaled interventions based on the transtheoretical model of change that included a motivational interview with smokers who visited a family doctor or nurse were associated with increased continuous tobacco abstinence at 138 and 2 years of follow-up;30 ,31 gender was not a predictor of successful cessation. For instance, three studies using intensive interventions reported significant positive effects at 1 year: six visits with a healthcare professional achieved 8.1% continuous abstinence, compared with 5.8% in a control group;30 a comparison of an individual intervention, group intervention and control group observed abstinence rates of 7.4%, 5.4% and 1%, respectively;37 and a complex intervention achieved 30.8% continuous abstinence compared with 11% in the control group.38 Twardella and Brenner did not obtain better cessation rates than controls (3%) when doctors provided an intervention based on counselling and the transtheoretical model of change, but did see improvement (12%) when free prescription medications were provided for patients.32 The intervention proposed by Smit et al35 combined two methodologies: Internet feedback messages and meetings with nurses based on the I-Change Model (ICM) supported by Prochaska's theories did not produce significant results. The study by Twardella and Brenner32 demonstrated greater effectiveness in smoking cessation in the presence of symptomatology or previous diseases related to smoking and older age, but an economic incentive for health professionals was not effective. On the other hand, Lou et al34 found a relationship between effectiveness and a non-smoking family environment and a family doctor and nurse who were not smokers. According to some studies, specific training for healthcare professionals who care for smokers who want to stop smoking may increase their probability of success.29 ,32 Twardella and Brenner32 point out that other studies had previously shown training programmes to have beneficial effects on the number of smokers identified and offered advice and support for quitting. However, the effect of the increased efforts on smoking cessation could not be proved. The pharmacological interventions identified include two classes of drugs that are effective in smoking cessation: nicotine replacement therapy (NRT) and bupropion. This review did not include any studies of complex interventions that included varenicline use in primary care. In the absence of a standard drug therapy in all studies and of any comparison of different medications and doses, it was impossible to analyse a specific effect for each drug prescribed at the discretion of the attending physician as a complement to some of the interventions reviewed. We assumed that medications were prescribed in accordance with current guidelines but were unable to analyse their effects on patient outcomes. One of the main inclusion criteria for publications to be reviewed was at least 6 months of postintervention follow-up. This was because shorter time intervals carry a very high probability of relapse and abstinence is not considered definitive until at least 6 months have passed without smoking. Therefore, the included interventions had a follow-up of 6 months or more. Most of the publications reported follow-up of 6 or 12 months. Cabezas et al30 and Puente et al31 also conducted a 2-year follow-up, and Lou et al34 reported on the longest follow-up, reaching a maximum of 5 years. The objective of the present review was to summarise on the effectiveness of multicomponent interventions with respect to continuous abstinence from tobacco. We included both randomised and non-randomised clinical trials involving smokers older than 18 years and attended in the primary care setting that assess continuous abstinence (at least 6 months) and include biochemical confirmation. Nine studies, eight RCTs and one non-RCT with these characteristics were identified. In the present review, we found that the multicomponent interventions included increased abstinence in the long term, achieving continuous abstinence after 1 year from about 7% to just over 40% in comparison with control groups (usual care). This wide range of percentages can be attributed to differences in patient selection criteria. Owing to the heterogeneity and differences in intensity of the interventions included, it can be complicated to determine the duration and type of intervention that is most effective in achieving better rates of continued abstinences. In general, we observed that with more components, more follow-ups by the health professional and more intense interventions, better smoking abstinence results were achieved. In addition, multicomponent strategies were more effective when medications were used and a ‘D-day’ was set. The published literature has observed that brief counselling in the healthcare setting increases the frequency of efforts to stop smoking. The systematic review by Aveyard et al45 found a risk ratio (RR) of 1.24 (95% CI 1.16 to 1.33) for brief counselling, less than that of behavioural support (RR=2.17; 95% CI 1.52 to 3.11) or NRT (RR=1.68; 95% CI 1.48 to 1.89). The effect of brief counselling on the rates of smoking cessation seems to be small; in a 2008 systematic review, Stead and colleagues found that brief counselling increased these rates only 1–3% compared with attempts made without medical assistance. More intensive interventions also contributed a benefit, although scant. A doctor's advice helps smokers to stop smoking, even if it is brief counselling. It appears that the intensity and follow-up can achieve higher rates of cessation.13 Individual counselling is frequently used to help patients stop smoking, but there is insufficient evidence to establish whether higher intensity counselling is more effective.46 The effectiveness of drug therapies is more clear: a review by Wu et al47 found that NRT, bupropion and varenicline are effective complementary methods of smoking cessation. Our data concur in large part with an earlier review,14 which reported that the effectiveness of multiple/complex interventions in achieving sustained smoking cessation in adult primary care patients had an OR of 2.2 (95% CI 1.7 to 2.8), compared with a control group. The same authors found differences between the effect of brief counselling and intensive counselling with a multicomponent intervention (OR 1.37, 95% CI 1.20 to 1.56) and also when medications were used to help the smoker (OR 3.45, 95% CI 2.8 to 4.2). With respect to intervention models, various trials analysed for this review used the transtheoretical model of change with positive results; however, reviews of literature have not arrived at a clear conclusion about the effectiveness of this model.48–50 Although the objective of the present review was not to specifically evaluate this model, the clinical trials indicate that it is well accepted by health professionals and the study populations. On the other hand, the Cochrane review by Stead and Lancaster15 points out that, without any doubt, the combination of behavioural strategies with drug therapies has been shown to be clearly useful, which is in accordance with the data reported in this review. Therefore, usual clinical practice should include interventions with more than one component, adapting the characteristics of the intervention to the type of service offered, and time and training of healthcare personnel is necessary to achieve a useful strategy. With respect to the research, more studies must be designed to clarify the combination of behavioural strategies and use of medications that is most effective in usual practice in specific population groups, and the cost-effectiveness of those combinations. One of the major limitations of the present review, and of all reviews in general, is the publication bias that in this case we attempted to control by searching for data in the STAN Bulletin, which publishes all types of news items and other information. Furthermore, it was not possible to include references from presentations at conferences and meetings, although we believe that the work with the greatest potential importance has been published in journals with an impact factor. We have only included those studies published in English or Spanish. Another limitation of this study, despite the rather strict inclusion criteria, is that the age of the participants, the populations studied, and the type and duration of the interventions and follow-up contributed to the heterogeneity of the results. In clinical trials, the most frequently recommended measurement of continuous smoking cessation is ‘continuous abstinence’, defined as no use of any amount of tobacco from the day the individual stops smoking until the day data are analysed. This definition has also been called ‘sustained abstinence’ and ‘prolonged abstinence’.27 The Cochrane Tobacco Addiction Group also references other types of abstinence: ‘point prevalence abstinence’ for short periods without smoking and ‘prolonged abstinence’, which is similar to ‘continuous abstinence’ and analyses abstinence after a grace period of about 2 weeks.51 In order to strengthen the reliability of the results, we decided to follow the recommendations by West et al52 and of the Society for Research on Nicotine and Tobacco Europe53 where they propose to undertake a biochemical verification to confirm smoking cessation. However, we may have incurred into some selection bias due to the fact that we have only included studies with biochemical verification of smoking cessation. Another possible bias in this review is the loss to follow-up; three of the studies reported more than 40% loss to follow-up (one of them reported a 76% loss). In order to limit this bias and to ensure a certain level of quality, we included only trials that used an ITT approach. In addition, we must take into account the increased motivation to stop smoking that is normally present in smokers who agree to participate in clinical trials. This review likely underestimated the effectiveness of some of the multicomponent interventions: In many RCTs, the control group is offered brief counselling by healthcare professionals, which in and of itself increases smoking cessation. Another limitation of the included studies is the lack of blinded interventions, but it is important to remember that the very nature of the behavioural interventions in many cases impede efforts to achieve a blind intervention. The search ended in February 2014 and it might be quite old, the analysis and subsequent steps took us longer than expected. However, we believe that the number of publications will have not changed and results will have not changed significantly. Our search strategy included the term ‘complex intervention’; consequently, we reviewed those articles that mentioned the terms ‘complex’ or ‘multiple’ in their title or abstract. This search strategy brought us to select nine trials, mainly conducted in Spain and in somewhat low impact factor journals. Maybe the research question is a topic of concern in the Spanish primary care community. Besides, there is not a clear consensus on what it is a ‘complex intervention’. Consequently, we may have omitted the analysis of some of the components that define an intervention as a complex one, such as the participation of some disciplines, changes in the environment or the effect of different professionals. All these aspects could be clarified in future reviews, but most studies do not offer this information on their publications. Future studies of complex interventions to achieve smoking cessation should use standardised methods to evaluate outcomes, as proposed by Hughes et al.27 On the other hand, as complex interventions are involved, interventions based on clinical practice guidelines must be standardised to incorporate the key elements of those guidelines, basically focused on behavioural and pharmacological elements. We therefore, believe that clinical practice guideline should recommend interventions with two or more components. Another recommendation is that the studies should analyse cost-effectiveness. On the other hand, the majority of the interventions were carried out in European populations (mostly in Spain), two studies in the USA population33 and one in China.34 Consequently, it is not clear whether the findings are applicable to other populations, and we believe it is necessary to develop this type of interventions and evaluate their effectiveness in other populations. Very few studies have evaluated complex/multicomponent interventions in the primary care setting that are designed to promote smoking cessation, even though this approach is useful, effective, safe, and achieves greater long-term continuous cessation (between 7% and 40%) than usual care and counselling alone (which also is effective). Behavioural interventions are effective and have a dose–response effect. In fact, the more support the smoker receives—more components, more follow-up by the health professional, longer duration—and the more personalised is the intervention, the greater the continuous smoking cessation achieved. Nonetheless, no differences were observed between the different types of intervention. The multicomponent strategies are more effective when the smoker sets a ‘D-day’ and medications are prescribed. The drugs used in the studies analysed (NRT and bupropion) are useful, safe and effective, with no differences observed between them. The use of other strategies such as providing patients with free medication can increase the success of these treatments. Therefore, a complex intervention to help smokers quit should include: several monitoring visits, longer periods to follow-up patients, behavioural components and possibility to set a ‘D-day’ and prescribe medication. Despite the evidence that multicomponent interventions are effective, it is not clear which of the components of the different interventions are key. Further research is needed to determine which combinations are most efficient. The authors thank Marta Jordan, Medicine Library, Universitat Autònoma de Barcelona, for her assistance with the search strategy; Enriqueta Pujol Ribera, researcher of the Institut Universitari d'Investigació en Atenció Primària (IDIAP) Jordi Gol, for her comments on the manuscript and in the process of selecting articles during the revision; and Edurne Zabaleta, IDIAP Jordi Gol researcher, for her comments and her assistance with manuscript preparation and submission, supported by Elaine Lilly (Writer's First Aid). They also thank IDIAP Jordi Gol for the institute's support for the study.
. Treating tobacco use and dependence: 2008 update US Public Health Service Clinical Practice Guideline executive summary. Respir Care 2008;53:1217–22. http://bphc.hrsa.gov/buckets/treatingtobacco.pdf (accessed 11 Dec 2014).
. Motivation for smoking cessation: what role do doctors play? Swiss Med Wkly 2001;131:521–6.
. 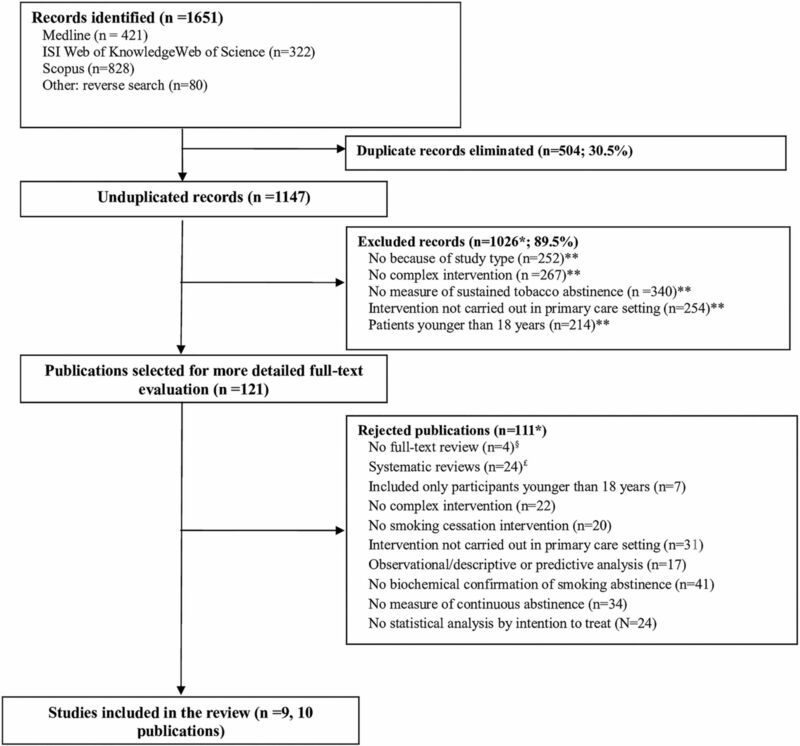 Systematic reviews of complex multicomponent health care interventions. Research White Paper. AHRQ Publication No. 14-EHC003-EF. Rockville, MD. Agency for Research and quality, 2014. http://effectivehealthcare.ahrq.gov/index.cfm/search-for-guides-reviews-and-reports/?productid=1878&pageaction=displayproduct. (accessed 11 Dec 2014).
. Ambulatory physician care for adults. In: Jaakkimainen L, Upshur R, Klein-Geltink J, Leong A, Maaten S, Schultz S, Wang L, eds. Primary care in Ontario: ICES Atlas. Toronto: Institute for Clinical Evaluative Sciences, 2006:53–76.
. Smoking & Tobacco Abstracts & News (STAN Bulletin). 2014.
. An evidence-based programme for smoking cessation: effectiveness in routine general practice. Br J Gen Pract 2000;50:803–7.
. Motivational interviewing. New York: Preparing people for change Guilford, 2002.
. The transtheoretical approach. Handb Psychother Integr 2005;2:147–71.
. Sustainability of a multiple risk factor intervention on cardiovascular disease in high-risk African American families. Ethn Dis 2008;18:169–75.
. Individual behavioural counselling for smoking cessation. Cochrane Database Syst Rev 2005;(2):CD001292.
. Smoking cessation: the state of the science. The utility of the transtheoretical model in guiding interventions in smoking cessation. Online J Knowl Synth Nurs 1999;6:9.
. Stage-based interventions for smoking cessation. Cochrane Database Syst Rev. 2010;10:CD004492. Tobacco Cochrane Addiction Group. Glossary. 2014. http://tobacco.ochrane.org7glossary (accessed 11 Dec 2014). Society for Research on Nicotine and tobacco Europe. SRNT-Europe chapter recommendations. Record keeping for smoking cessation services. 2014. http://www.srnteurope.org/assets/record-keeping-for-smoking-cessation-services.pdf. (accessed 11 Dec 2014). Contributors CMC planned the study. CMC and EP performed the searches, screened articles in duplicate, abstracted the data and drafted the manuscript. All authors performed critical analysis of abstracts and main text and assisted with any unresolved disagreements. All authors were involved in developing the study. All authors read and approved the final manuscript. Funding The project has received funding from a Network for Prevention and Health Promotion in Primary Care (redIAPP, RD12/0005) grant and a research project grant (PI12/01914) from the Instituto de Salud Carlos III (Institute of Health Carlos III) of the Ministry of Economy and Competitiveness (Spain), co-financed with European Union ERDF funds.